Pre-browned pork is simmered in the slow cooker with potatoes, coconut milk, and green curry paste. 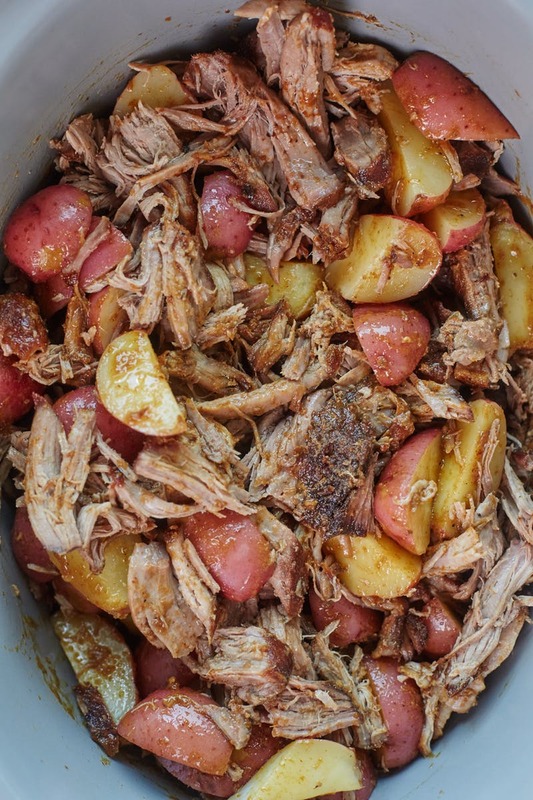 Use the Recipe-by-Photo Index Page for Pork to see all the slow cooker pork recipes that have been featured on this site. If you don’t count the salt and pepper, there are only five ingredients in this Slow Cooker Coconut and Green Curry Pork from The Kitchn: pork, oil, potatoes, coconut milk, and Thai Green Curry Paste. The curry paste has all natural ingredients and no preservatives, so it’s something I’d happily use to make a slow cooker dish that tastes like it came from a Thai restaurant. This recipe calls for browning the pork under the broiler before you put it in the slow cooker, and I definitely wouldn’t skip that step for added flavor. Then put everything in the slow cooker and let deliciousness happen while it cooks on low for 6-8 hours. Optional: chopped cilantro or chives for garnish, toasted unsweetened coconut for garnish. Get the complete recipe for Slow Cooker Coconut and Green Curry Pork from The Kitchn.